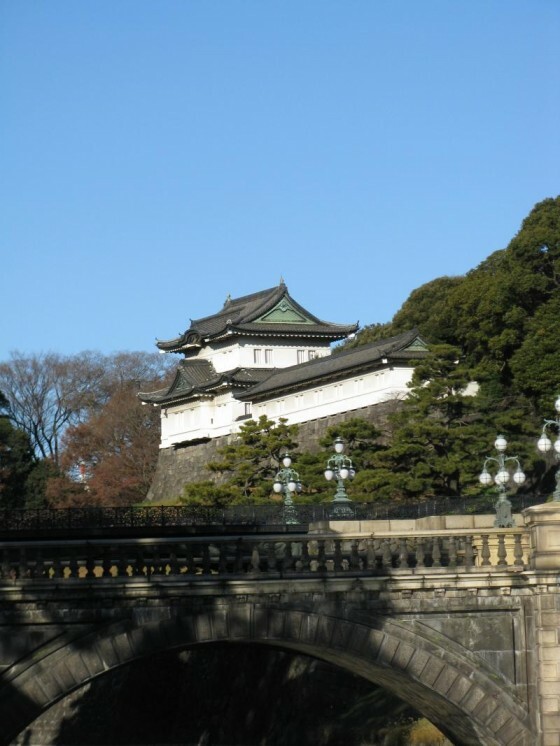 Are you considering whether you should go to Thailand or Japan on your next vacation? The points of comparison below should help you to make an informed decision. No contest here in the winter time, Thailand has much nicer weather at this time of year (January…I do not know what the weather is like at other times of the year, and I do know that Thailand has a wickedly rainy season…so do your research!). It is colder here in Tokyo right now than I think it is at home in Minnesota. Definitely winter here. If weather is a consideration in your decision to go to Thailand or Japan in the winter, I vote for Thailand! Sidewalks were almost non existent in Thailand. The ones that were there were either filled with vehicles, riddles with holes and debris or occupied by mean looking dogs or piles of smelly trash. Continuing on the mean dog note, there were a minimum of 2-3 dogs on each block, many of them sick and infected looking, many malnourished with sores that were oozing pus. As a result, we rarely saw Thai people walking anywhere if they had any other option. Crosswalks were non existent in many places, so you just had to look carefully and leap before cars came. Oh, and police officers were a rare sight in all of Thailand. We only saw them at rush hour directing traffic at particularly busy intersections. Police and security guards were EVERYWHERE. When we walked past constructions sights that were near pedestrians on the sidewalk, there was one guy standing there just to watch pedestrian safety. Tokyo definitely wins the category for pedestrian safety. Tokyo has sake, so there is a big plus there, but I am not crazy about sushi. We ate some pork over rice tonight over Miso soup from a fast food restaurant, and it was good. I generally LOVED the food in Thailand, and it was much cheaper. We ate many meals on the street for 2-3 dollars for both of us. Even when I ate out in a restaurant one night, I paid about $4 for a HUGE bowl of Khao Soi (noodles and vegetables in broth with chicken) and a bottle of water. Then, there was the yummy banana deep fried in an egg roll wrapper and drizzled with sweetened condensed milk, and the mango and stick rice….yum. Thailand wins on the food front. Obviously, Tokyo, hands down. Bangkok was filled with trash. It was everywhere. The city stank of trash and animal excrement. The rest of Thailand was better, but Tokyo was clean to a fault. No trash on the streets, and very clean smelling for a big city. Tie. Both countries have a wide range of hotel accommodations available. Hostels, hotels, bed and breakfasts, pod hotels and everything in between. Obviously from a cost perspective, hotels and other accommodations in Thailand will always be cheaper than accommodations in Japan. 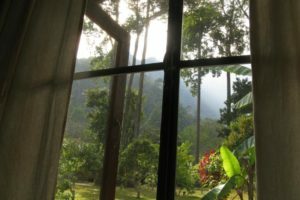 Barring that difference, the places that we stayed at in both countries were clean, efficient and safe feeling. Bangkok wins this one. To get in from Narita airport in Japan, it involved $30 and 90 minutes on the train with multiple transfers (plus a 1 mile walk at the end to get to our hotel). Getting to our hotel in Bangkok was just about the easiest thing that I have ever done. Once we got a cab outside of the Bangkok airport (which did involve waiting in a line for about 20 minutes) it cost us $12, took about 25 minutes and the driver dropped us off directly at the door of our hotel. This one might surprise you. Thailand wins my vote for easiest/best quality internet access. There were internet cafes everywhere, lots of restaurants and cafes had free wifi available and all of the guest houses that we stayed at it offered some form of wireless internet included with our room. 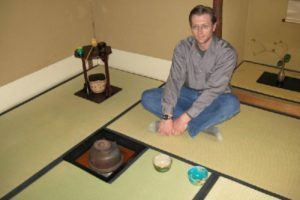 We have been having a hard time finding wireless internet access for our computer in Japan. Signals that are supposed to work don’t seem to for unknown reasons, or the signal isn’t strong enough to make a good connection. We have bought coffee at countless coffee shops all over Japan trying to get wireless access to no avail. Finally, we got a decent connection at Mc Donalds, but this and Starbucks were the only two places that we found reliable internet connections (many coffee shops only offered wireless for phones through a Japanese cell phone provider called “Softbank”, but this generally didn’t help us connect with our computer. This was very surprising to me for a country that is so technologically inclined. Thailand had better shopping, no question. Obviously, prices were cheaper, so this has to factor into my comparison, but separate from the price issue, the markets in Thailand can’t be beat for variety and sheer joy of the shopping experience. During the day, there are many easily accessible food markets in Thai cities to buy spices and unique local foods (including lots of fresh fruit!) The night markets are THE place to go for souvenir shopping. Yes, a lot of the stalls carry the same touristy junk, but there are also hidden pockets of unique, one of a kind handicrafts at prices that are incredible. Want to find out what other travelers enjoyed doing most when traveling in Thailand and traveling in Japan? Make sure to bargain to get the best price. It felt awkward to bargain at first, especially because the dollar is so strong against the baht that it hardly seemed worth it sometimes for the fifty cents or a dollar that it would save me, but it is part of the experience and the vendors mark everything up expecting you to do this. Decide what feels like a fair price to you after having a look around a bit to get your bearings, and offer slightly below this so that they will come up a bit to the price you wanted. If it still is too high, keep going and you will probably find the same thing at another vendor down the street. Chances are good that as you are walking away, they will agree to your price rather than lose your business to a competitor. Shopping in Japan was good, as well. We saw lots of beautiful ceramic bowls, sake cups, chopsticks and the like, and many local handicrafts. I didn’t allow myself to buy much because of our budget (things are quite expensive in Japan, especially compared to the weak USD right now. A postcard cost us $1.50!) 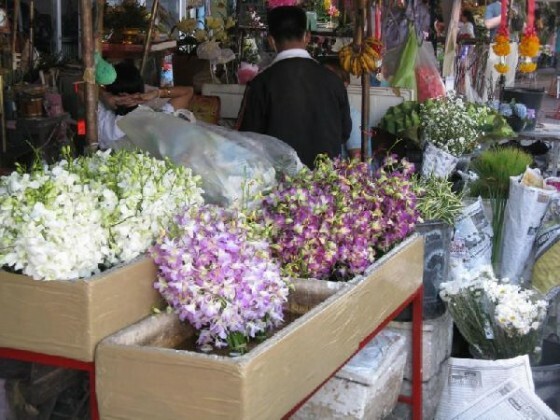 so there are plenty of nice souvenirs to be had, but the shopping experience just didn’t compare to the exhilaration of shopping in the markets in Thailand. While more people spoke English in Japan (most people spoke fluently and just about everybody spoke a little) many things were not printed in English. I don’t say this in judgment, only in comparison, as I never go to any place making assumptions that everything will be printed for us in English. Winner-Thailand. Japanese restaurants and shops just didn’t feel very welcoming to us. All it would have taken in most cases was a small sign in English on the outside and we might have felt adventurous enough to go in, but this was not usually offered. In contrast, far fewer Thai people spoke English, but the vast majority of signs and written communications were in English as well as Thai. This made a huge difference for us in the intimidation factor. The preponderance of English has a lot to do with the huge numbers of expats living there from English speaking countries (mostly US, UK and Australia, from what I could tell.) If you were really in a pinch, there was generally always somebody around that spoke our language to help out. Communication and understanding were significantly better in Thailand. 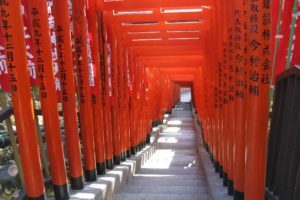 I hope that this post was useful for you in deciding whether to go to Thailand or Japan on your next trip. 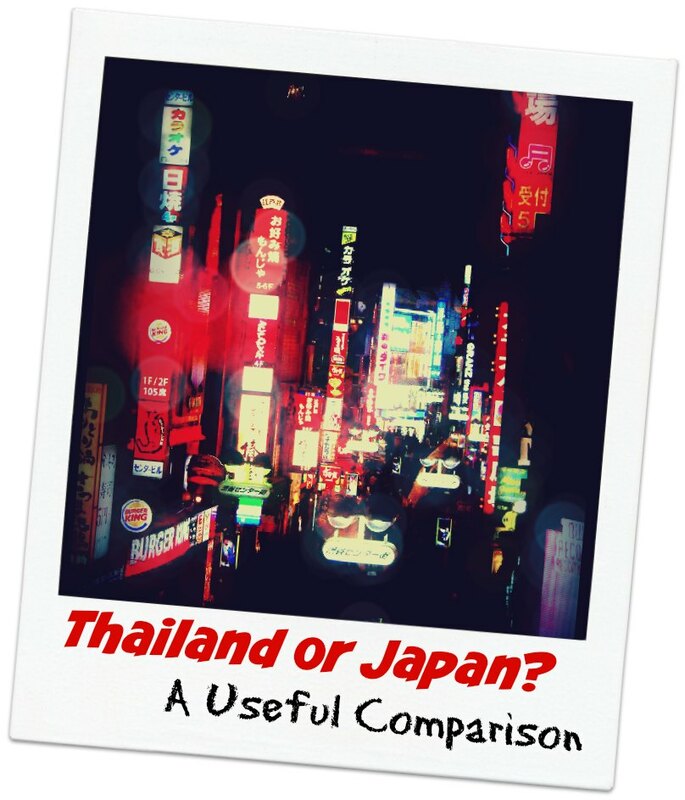 Which country did you like better, Thailand or Japan? Why?